The 2011 Tokyo Motor Show opens to the media next week and Japan's automakers plan to showcase an array of models to put some buzz back in the show. Honda Motor Co. will debut a trio of concept cars at the Tokyo auto show that foreshadow the Japanese automaker's vision for a battery-powered future. The concepts presage cars that could come to market about two generations from now, say in 2020. A key feature of each of the cars is a pair of steering handles that are pulled backward and forward to direct the car instead of a wheel. Honda says the technology is intuitive and much like steering a bicycle. When you want to turn left, you move the right handle forward. When you want to move right, you do the opposite. AC-X: The AC-X, for Advanced Cruiser Experience, is a wedge-shaped plug-in hybrid sedan that takes heavy styling cues from the Honda FCX Clarity fuel cell vehicle. For improved aerodynamics, it has an adjustable rear diffuser and body undercover that extend during highway driving to improve mileage. Formula One-inspired wheel covers also help. The AC-X, with a drag coefficient of 0.21, targets fuel efficiency of 110 km per liter, or 258 U.S. mpg, with its 120-kilowatt electric motor and 1.6-liter engine. It is expected to go 31 miles (50km) in electric-only mode. Micro Commuter Concept: This three-seat city runabout follows in the tradition of the Nissan Pivo concept series and the Toyota iQ minicar. Its lithium ion battery gives it a range of 37 miles. But the so-called Loop Batter battery pack also can be taken out and plugged into other vehicles, including an electric minimotorbike. That two-wheeler, dubbed the Motor Compo, can be loaded aboard the Micro Commuter Concept. Colorful body panels can be swapped in and out like the exchangeable skins of a smartphone to customize your ride. 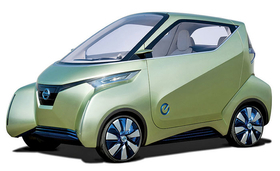 Small Sports EV Concept: Honda is waiting until the show to give detailed specifications of this compact convertible electric vehicle. But sketches depict a stubby, low-slung car reminiscent of the CR-Z sporty hybrid. Mitsubishi Motors Corp. will unveil a close-to-market version of a plug-in hybrid crossover due next year and a new global small car bearing the revived Mirage name at the Tokyo show. 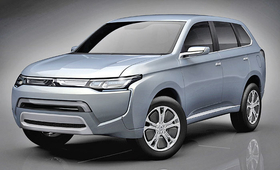 The all-wheel-drive PX-MiEV II hints strongly at the hybrid version of the Outlander crossover that Mitsubishi plans to launch in the Japanese fiscal year that begins April 1. It uses a two-motor plug-in hybrid system running on a lithium ion battery and a 2.0-liter, four-cylinder gasoline engine. One motor powers the front wheels; the other, the rear ones. The Mirage enters production in Thailand next year and is bound for the United States as early as 2013. The hatchback replaces the Colt, which is being phased out. Mitsubishi dropped the Mirage nameplate in the early 2000s. The Mirage is 10 percent lighter than the Colt. It is powered by a 1.0-liter three-cylinder engine mated to a continuously variable transmission. Nissan Motor Co. is rolling out an update of its compact Pivo electric car with four-wheel independent steering at this month's Tokyo show. The Pivo3 looks much closer to market than either of its "bubble-on-wheels" predecessors, the first of which was shown at the 2005 Tokyo show. The Pivo2 appeared two years later. But like its cousins, which take the name Pivo from "pivot," the Pivo3 is highly maneuverable with a tight 6.5-foot turning radius, thanks to in-wheel motors that allow its wheels to turn independently. The car can do a U-turn on roads only 13 feet wide. Another big difference: The Pivo3 features what Nissan calls "Automatic Valet Parking." The technology allows the Pivo3 to park itself in specially equipped parking lots. While the driver is away, the car also recharges its battery. And when it is time to go, the driver simply summons the Pivo3 by mobile phone and the car drives itself to pick up its owner. Subaru will introduce an updated vision for its hybrid due in 2013 at the Tokyo show. The all-wheel-drive Advanced Tourer Concept is based on Toyota technology. It gets a downsized 1.6-liter, turbocharged, direct-injection engine teamed with a hybrid electric motor system and Subaru's latest continuously variable transmission. Subaru also will show a production version of the BRZ rear-wheel-drive sporty car. It will unveil a concept of an STI version of the BRZ at the Los Angeles Auto Show this week. Suzuki Motor Corp. will spotlight what it calls its "unparalleled expertise" in small cars at the Tokyo show with two new tiny concept cars and the world premiere of a Swift electric vehicle with a range-extending engine similar in design to the Chevrolet Volt. The so-called Swift EV Hybrid concept is based on the Japan-made Swift small car, which was once planned for the United States but was put on hold when the yen's rise against the dollar made exporting the car to the United States an unprofitable proposition. The car runs on electric power for about 11 miles. When the battery runs down, a gasoline-powered engine generator kicks in to recharge it. The engine does not directly power the wheels. 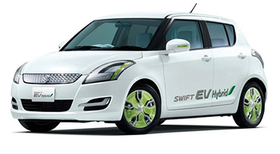 The Swift EV Hybrid follows the Swift Plug-in Hybrid concept that debuted in 2009. That vehicle drew on both the engine and the battery to power the wheels. That concept never made it to showrooms. Suzuki is still seeking a market entry with an electrified drivetrain. Suzuki had hoped to use its partnership with Volkswagen AG for help with hybrids. But Suzuki says it wants to end the arrangement. That leaves Suzuki as the only one of Japan's big seven automakers without firm plans to launch a hybrid or an electric vehicle. Suzuki also plans to introduce two minicars. The first, the Regina, embodies its concept for its next-generation global small car. It weighs only 1,609 pounds and achieves 75 mpg under Japanese testing cycles, which are not comparable to U.S. mpg ratings. The other is a bubble-shaped two-seater called the Q-concept. Suzuki says the vehicle is positioned between a motorcycle and an automobile and is meant for short urban commutes. The AC-X, with a drag coefficient of 0.21, targets fuel efficiency of 110 kilometers per liter, or 258 mpg, with its 120-kilowatt electric motor and 1.6-liter engine. It is expected to go 31 miles in electric-only mode.